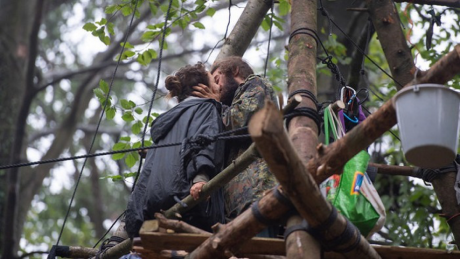 It has been proven yet again: fighting is the way forward, and in the Hambach forest in Germany, mobilization has paid off. The total destruction of a thousand-year-old forest has been stopped, at least temporarily. This has been possible thanks to the tenacity of a group of young people who have resisted the attack of one of the great German transnational corporations: the Rheinisch-Westfälisches Elektrizitätswerk AG (RWE) which, again and again, has used violence to devour the forest. These young people should be praised for resisting even though they knew that only 10% of the forest is still standing... perhaps other groups would have lowered their guard. This, however, did not happen. The consequences of their success are more significant than what they appear at first glance. Even if the perverseness of the forces of destruction prevails, a new debate is already going on in Germany about Energiewende (energy transformation). This interesting initiative from below, co-opted by the State when its results began to affect the monopolistic German business structures, has in fact become trapped in government regulations tailored to fit the interests of the big energy suppliers, with RWE at the forefront. In its latest report, the International Panel on Climate Change of the United Nations (IPCC) is categorical: urgent "quick changes" are needed, leading to an "unprecedented" and "far-reaching" transformation in electricity, agriculture, cities, transport and industry. But there is much more to it than that. It is not just a question of replacing lignite coal, which accounts for 25% of the electricity production in Germany and causes 50% of the greenhouse gas; radical and disruptive measures must be taken urgently. If we are to meet the goal of 1.5 degrees Celsius maximum incremental warming, emissions of carbon dioxide (CO2) – by 2030 the main greenhouse gas - must decrease by 45% as compared to their 2010 level. In 2050, these emissions - coming mainly from fossil fuels, such as lignite - should stop altogether: which is, as El País understates, “something really complicated”. No more patching up like the much-touted and sterile achievements of the 2015 Paris Agreement, which were not improved by the climate change summit held at the end of last year in Bonn, Germany, as we denounced in due course. There is no room for doubting, we must overcome this current, essentially anthropocentric and androcentric capitalist civilization. The maelstrom of economic growth must stop; de-growth should be compulsory, especially in the global North. In a finite world, there is no room for permanent economic growth. To keep on following the current path would lead us to a world increasingly unsustainable in environmental terms and increasingly explosive in social terms. Protecting nature (Mother Earth) including humanity implies, under no circumstances, sustaining the existing social inequalities which allow affluent social groups in the North and South to maintain their privileged, unsustainable way of life. Nor can we hope that technological solutions or the commodification of nature, the so-called green economy, will provide us with growth options safely. The answer is always political. Even de-growth and post-extractivism, which do offer ways out of the capitalist labyrinth, require political decisions driven by political preferences. It has been established that economic growth, generated by capital greed, which accumulates through production and speculation, is built upon growing inequality. It has been noted that social inequality, characteristic of capitalism as a civilization of inequality, is a global phenomenon and exists even in "successful" economies, where frustration and unhappiness are incessantly increasing. In short: economic growth, the engine of capital accumulation, causes increasing environmental damage. The Commons is the only means by which we can bring down capital. The great transformation which humanity demands will be undertaken by societies founded on equality, which is what makes a global ecological and social balance possible. This is not something that will be resolved overnight, of course. We need to create multiple transitions from a thousand different alternative practices, many of them non-capitalist, which already exist around the world, oriented by utopian horizons advocating life in harmony between human beings and between themselves and nature. It is a matter of carrying out a patient and determined (re)construction, which starts by the dismantling of several fetishes, such as economic growth and extractivism, and fostering radical changes based on existing experiences. If in Germany the expansion of this large lignite mine in the Hambach forest has definitely stopped, prioritizing life over capital, and as a concrete signal of the willingness to be doing something effective to face climate change, a very powerful message would be projected onto the world. We need to set up and link national and international networks in order to strengthen the resistance and the alternative paths underway. There are many common minimums and different paths and temporalities for each process in the world. And if we pay due attention, we will hear "the light breath of the future" as Ulrich Grober suggests in a book with the same title, after a fascinating walk through the reality of Germany in search of sustainable values ​​and that kind of positive energy that social breakthroughs in the making foreshadow. If in Germany the expansion of this large lignite mine in the Hambach forest has definitely stopped, prioritizing life over capital, and as a concrete signal of the willingness to be doing something effective to face climate change, a very powerful message would be projected onto the world: it would encourage all actions aimed at making post-extractivism possible. We need unprecedented ruptures, like those proposed by the Paris-based International Energy Agency (not precisely an ecologist platform), which is asking to keep two thirds of all known fossil fuel, oil, gas, coal, reserves in the subsoil, if we are to avoid the temperature of the Earth growing by more than two degrees Celsius. And even if we were to assume the challenge, the chances of success would only be 50%. Therefore, the proposal to leave the lignite in the subsoil of the Hambacher Forst ties in with another proposal which stands as a world reference: the Yasuní-ITT Initiative for keeping the oil underground in the Ecuadorian Amazon. Despite some setbacks, this initiative continues to be a great example of global action. Now, the success in Germany – and the continuing action by the young Yasunidos - and the change in the repressive conditions in Ecuador make it is possible to dream again of leaving the oil in the Amazon subsoil, despite the fact that the exploitation of oil in that region, considered a true "Noah's Ark" but to its intrinsic wealth, is already underway. This is the challenge: creating proposals from below, especially from the communities, and always from the Pacha Mama, affirming the reproduction not of capital or power, but of life. The task is enormous. Young people of the world, unite!